I get dragged to a lot of sales events and the one thing I love to do at a sales event is to observe. When I'm observing the human condition I'm trying to understand why people buy and why they don't buy. When I'm observing the a process I'm trying to understand what works and what doesn't work. Most events will provide you with plastic bags to hold your items which sometimes worked depending on the size of the items at the event. 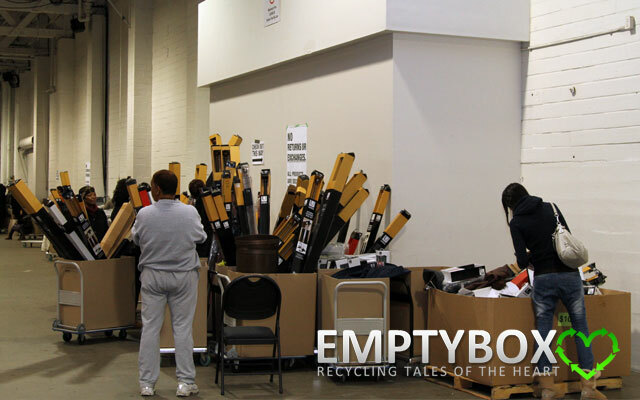 The very first Umbra sale I went too, several years ago down at the CNE Exhibition Centre, handed out bags which didn't make sense because of the large items that couldn't be put into bags. Free hands - The less you have in your hands the more you can concentrate on buying more items. Weight - All the weight is off your arms allowing you to have a pleasant shopping experience. 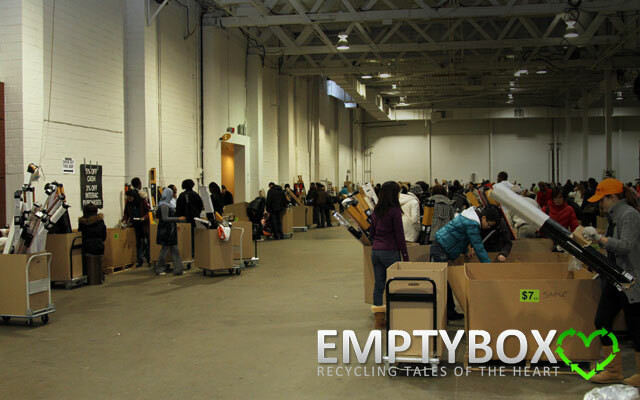 Storage - The bins are high enough to store lots of items from various sizes. Transporting - The rigidness of the cardboard comes in handy when you need to transport your items to your car. Case Study: The introduction of carts with large cardboard containers was a brilliant step in the right direction. "Absolute freedom is the same as absolute chaos." Leaving shoppers to regulate themselves is an impossible task during a sales event. Adding to the flames of chaos are open bins. Breakage - Open bins allows shoppers to grab items and throw back unwanted items haphazardly causing breakage or potential damage to other items. Opened Goods - Sometimes an opened product goes missing and the shopper is forced to open up another item only to put it back in the bin vs putting it back in its original packaging. Appeal - The number of broken and opened goods found in a bin can reduce the likelihood of attracting and converting shoppers. One of the tell tale signs a product isn't popular is the visible quantity in the bins and how many products look like they have been thrown back into the bin. It goes back to my "King Crab Theory". 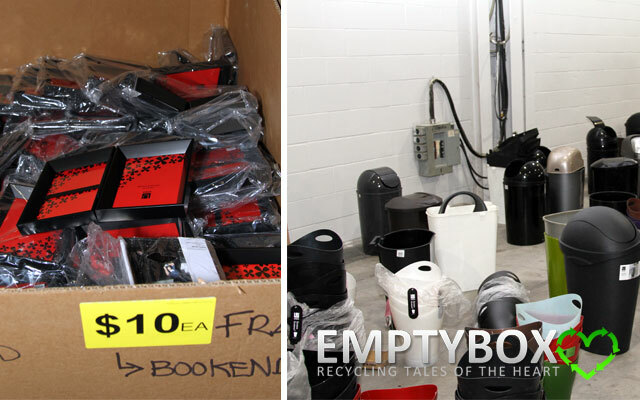 Case Study: Opened products and unorganized bins create an unappealing impression on shoppers. In some cases there would be more than one product opened in a bin. In one case there was broken glass from a picture frame in one bin. 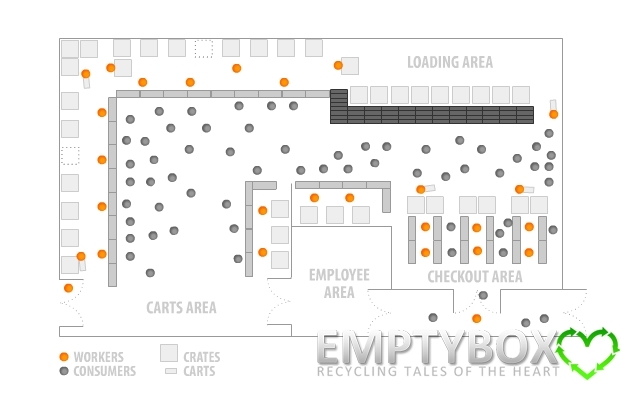 Having return bins located against the walls is convenient for the shoppers but it has adverse effects for the workers. Breakage - The break you buy clause is no longer under effect when shoppers have the freedom to discard items haphazardly into open bins. Resulting is a loss of profit and damage to other goods which devalues their appeal to shoppers. 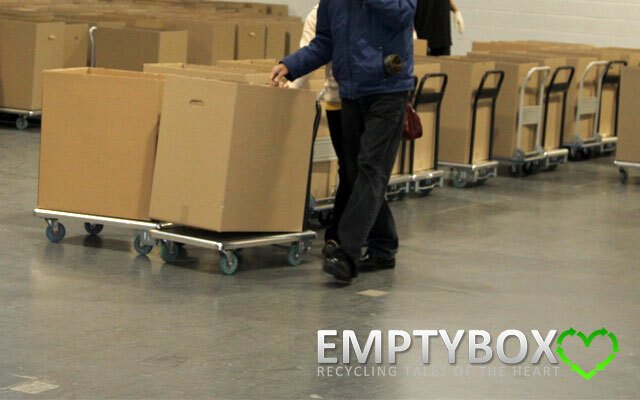 Return Process Slowed - Workers have to navigate to each return bin to gather products for return. Added to the delay is the navigating through the sea of shoppers to return the products. Loitering - Often times consumers who are done shopping are sorting through their items in areas that take up much needed room for consumers who are still in the shopping phase. Case Study: The process is slowed to a point where the workers couldn't keep up with the discarded items. Adding to the already congested aisles are workers carting returned items and trucking in new crates of products to the sales floor. Return/Restocking Process Slowed - Trying to get through a sea of shoppers to return items is tough and even tougher if you were pulling a crate behind you. Most shoppers are visually impaired with tunnel vision during a sale causing delayed reactions when you need shoppers to move aside. As a result workers are spending more time trying to return items and restock products on the floor. Safety - Shoppers will be attempt to grab items from a moving crate being pulled to a new location on the floor. 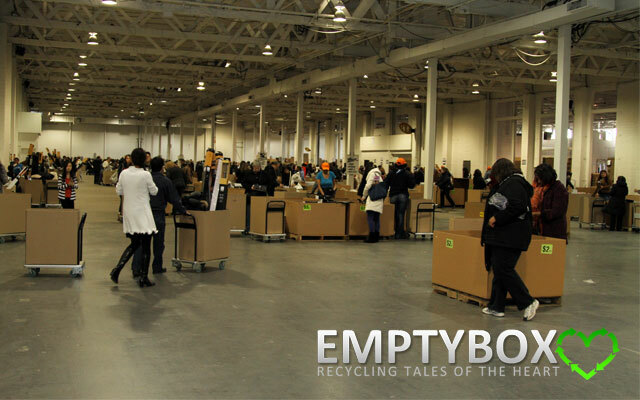 Case Study: A worker in an orange hat can be seen returning an item to a bin. Often times when people are rushed they end up making mistakes. As in the case where the cardboard is being ripped back by the worker as a result of improper product handling. Set up tables along the walls to separate the consumers from the workers. Place the bins behind the tables and one or two opened products on the table for the consumer to view. Keep in mind none of the solutions being presented are hypothetical. They are actually implemented and used in other sales events. 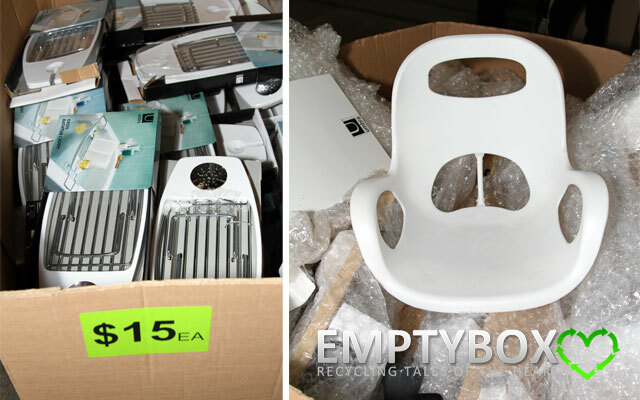 Reduction in Breakage - Consumers are no longer able to throw items back into bins haphazardly or unintentionally damage goods. Reduction in Open Goods - Since there is always a product at the table there is no reason for additional products to be opened. Increased Safety - Consumers are no longer exposed to dangerous situations involving broken items or electrical outlets. Increased Efficiency - Creating a sectioned off area, by using tables as a barrier, allows workers to freely move behind the scenes to return items and restock items that are low. Increased Appeal - No longer will consumers be able to dig through the bins to get to the middle layer where products are unscathed and free of imperfections. The top layer will always be given out reducing the likelihood of a bad product through controlled returns. Reduced Loitering - By utilizing the wall space consumers no longer have a place to loiter and frees up much needed space for consumers who are still shopping. The added bonus is that those who are in the discarding phase will be closer to the checkout. The most often question that shoppers will ask themselves is the items usability factor. Unfortunately, most shoppers will not try to think outside the box or in this case think outside the product packaging to find alternate uses for a given product. Product Packaging - A photo is worth a thousand words but only if the viewer knows how to visually read it. More often a product's packaging will cast the product into a specific role that cannot be revoked in the minds of a shopper. Case study: I overheard one couple asking the other if they knew anyone who still took baths and the response was a shoulder shrug. When you look at the picture it's easy to see why they came to that conclusion and moved on. A good measure on the web for "usability" is how much the user has to think in order to achieve an end result. Product Staging - Staging is often used in real estate to increase the odds of making a sale. With a flat table top surface you can stage items to give shoppers an idea of the usability of an item. Product Experts - Some events that employ the stand solution don't have knowledgable staff behind the tables. As a result you are left to your own interpretation of the possible uses of a given product. Product Packaging Redesign - According to a Nielsen report on consumer trust you are better off leaving the actual sales up to your consumers. Do away with the large staged photo on the front of the box and keep it simple with a silhouetted product shot with smaller staged photos of alternative uses. Implement QR codes and website urls on the packing that link back to the product on the website. Get consumers to submit photos of different ways they have used the product and write product reviews. Product Printouts & Pricing - One great thing I noticed about the Fruits & Passion sale was their use of product printouts. Giving you just the right amount of information in a professional looking manner. A couple walks up to the table to find an opened product on the table. Unsure of the usability of the product they turn and look at the print out which has detailed information on the price, usability and benefits of the product. Instead of mocking up a design I figured listing the information would get the point across. You'll have to refer to my post on Fruits & Passion for an example of a product spec sheet. Get bath products off ledges - Typical bath tub enclosures are designed with no nooks (embedded shelves) for bath products. As a result bath products are normally kept on ledges or corners which restrict the flow of water on the ledge. Less mildew build up - Getting your products off the ledge will allow the water to drain properly and not sit under your bath products growing mildew. Less cleaning - Less mildew equals less cleaning as your grout lines and caulk lines will mould less frequently. Another consumer might approach the table and see that all the products are occupied and ask the product expert behind the table for more information on the product. The response would be a summarization of the product information sheet. At which point the consumers at the table can make their decision and ask for a quantity of items and the worker would turn around and retrieve said number of items to give to the consumer. Part of the mystery behind major sales events is you never know what is going to be sold at the event because nothing is ever released. Less Excitement Less Buzz - The result is potentially fewer people coming out to the event. Accessibility - Some people don't drive so a lot of people have no way of capitalizing on an event like this. It is not uncommon to go to a sales event and see consumers whip out a phone to find people that would be interested in a specific product. The solution is simply to release a press kit of all the information including photos of items being sold. In the case where you don't know what is going to be sold I would suggest getting a team on site to shoot products as they come off the truck and compile a Press Kit on the day of the Friends & Family event which is exclusive from the general public. Another alternative is to give people the right to take photos for an event. The photos usually release are ones that looked like they have been smuggled out of the country or take secretively. Greater Turnout - Detailed photography shots of the items being sold and their prices for all to syndicate through youtube, blogs, forums, news outlets, etc. Micro Transactions - Having an idea of what's being sold friends can put together a list of things they would like bought on their behalf. A consumer who was original buying for one might be buying for X number of people.